Want to read more? Visit Mary's related blogs for deeper insights on faith, family, caregiving and more. Our aging society is obsessed with looking, feeling, and staying young. We diminish wrinkles, cover the gray, whiten teeth, and firm sagging skin. Another option in our search for the fountain of youth may well be to strengthen our faith. Research is showing that spirituality is one of the keys to longevity and vitality. People with strong faith do indeed live longer, happier, and healthier lives. More importantly, building our faith is also an important factor in our transition from this life to the next. The body is a temporary vessel and a temple for the Holy Spirit while on earth. But our soul exists eternally and so demands the greatest attention. Nurturing faith then becomes increasingly more important with age. Young in the Spirit. 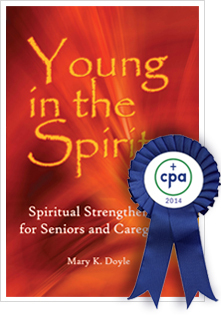 Spiritual Strengthening for Seniors and Caregivers, addresses the benefits of spirituality in regards to aging and ways in which one’s faith can be strengthened. Suggestions are substantiated with personal experiences, credible studies, statistics, Scripture, and Tradition in this very readable book. Some ways are ones we can seek out and build on such as daily prayer, friendships in the faith community, and sharing our spiritual autobiography. Others are naturally encountered with age. Illness, loss of loved ones, and caring for our parents, spouses, and siblings, and requiring care ourselves, places us in positions of physical and spiritual vulnerability. These situations also offer us opportunities to lean on the Lord, saints, and angels and tap into the Christ within each of us. This book is such wonderful support for those who are Caregivers or who are Seniors. I wish I had this book when I was going through my caregiving part of my life. It is so informative and right on with the Spiritual and what needs to be done, that it took my breath away. I thought "O how true, spot on". I hope Mary continues to write books like this for those who really need support during these times and for those who need to get ready for these times. Most people go through these two things in their life at some time and point. There is no getting away from this. I highly recommend this book for people who deal with these situations in any form, hoping that they would recommend this read for those who it can really help. We’re getting older by the minute, individually and globally. More people are living far into their senior years. Scientific and technological advances offer significant resources and assistance, but getting to a ripe old age is only half the equation. We want our bodies, minds, and spirits to be fit and purposeful. It’s been well established that a spiritual life improves every dimension of our well-being, from attitudes of gratitude and compassion to improved immune systems and lower rates of depression. Mary K. Doyle’s brief writing is brimming with practical encouragement and pastoral guidance grounded in Scripture as well as in respected theological, psychological, and social works. With suggestions that shouldn’t surprise us—intentional daily devotion, active participation in communities of faith, serving and caring for others—Doyle gently reminds us to use our time wisely, living to the fullest.